Norman Cathcart Deck was born in Sydney. In 1896 he became the youngest member of the Photographic Society of New South Wales. He graduated as a dentist from the University of Sydney in 1906 and, after a period working in rural New South Wales and Queensland, established a practice in Sydney in 1909. He started exhibiting his photographs while studying in 1903. The central part of his life, from 1914 to 1948, was spent working as a dentist in the Solomon Islands and the Pacific, sponsored by a missionary society. During this time, he continued to send work back to Australia for inclusion in photographic salons. In 1978 the AGNSW staged a survey exhibition of his work. He died in 1980. Among the Sydney pictorialists Deck remained firmly committed to a style of tonal impressionism which its practitioners believed derived from James McNeill Whistler. His romantic images of Australian coastal scenery, marked by ethereal forms and sinuous lines, probably owe just as much to art-nouveau design popular at the time. 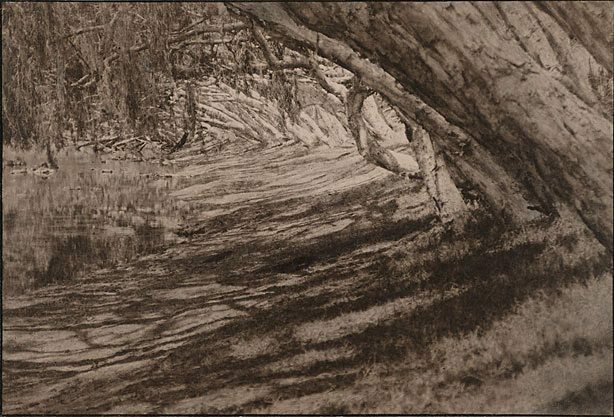 ‘On the bank of the Burdekin (Queensland)’ might easily be mistaken for a charcoal sketch. Some pictorialists would not have approved of this comparison, but photographers like Deck were happy for their work to be praised for ‘all the beauty and softness of wash drawings … entirely non-photographic in appearance’.1 The strong sunlight in the work, rather than clearly delineating objects, as is usual in Australian art, actually breaks up the forms and contributes to the remarkable graphic quality of the work. Signed and dated c. verso board, ink " Norman C Deck/ (1905)". Signed l.r. board, pencil "N.C. Deck". Dated l.l. board, pencil "...(1904)" and u.c. verso board, ink "...(1905)".